For each engine, two personnel were required, it stated, and that the examination would typically take 9-14h for a revenue flight and 6h for a non-revenue flight. An oil fire is believed to have been responsible for the failure of the intermediate turbine disc on the Qantas plane forced to make an emergency landing in Singapore on November 4. Rolls-Royce will will introduce a software fix that will stop the engine from getting near the point where it disintegrates, as well as hardware modification related to bearings. The changes were revealed today by Airbus, which also said it would pull already modified engines from its production line to help Qantas get its aircraft back in the air. Oui , Merci Poncho ! On était sur 2 front ! Dire que enfin le mot magique ... bearing est prononcé, par un client, de plus ! bien, ils peuvent induire des vibrations et aussi détruire cannelures, joints etc ! A suivre, car un roulement neuf c'est une chose, un roulement re-calibré, re dimensionné disons, et ré installé, c'est une autre chose ! Des moteurs Already Modifiés, rassurant cela, ils étaient donc dessus depuis qq temps RR! Espérons juste que les moteurs clients en place recevront plus que des roulements neufs ! Une vraie MAJ, c'est le plus probable ! Noter que les Fadecs vont intervenir si le moteur s'emballe, coupure probable (Ou réduction) de l'injection de kéro, action de MAJ pouvant être implantée rapidement ! ... Viennent peut être d'inventer le rupteur de sur-régime ... chez RR ! Ouarf à breveter ! On se demande pourquoi cela n'existait pas sur les Trent... il aura fallu le boum de Derby ??? Surtout ne pas penser que les modifs Soft plus Hard apportées chez Boeing sur les T1000 soient "Related" mot ayant disparu du vocabulaire de RR ! Bon, Airbus va Aider avec qq moteurs neufs ... normal ! Mais leur ligne de production va encore souffrir ! Sauf pour Qantas, qui ne voleront pas avant d'avoir tout modifié et /ou remplacé, on les comprend ! Et qui vont perdre une part de leur saison d'été chez eux ! Et c'est John Leahy qui cause ! Sur place à Sydney, les mains dans le cambouis, lui ! Ce seraient les boites à roulements Bearing Box, ou Casings ! Bien la boite, et / Ou les roulements d'arbres ! Ca commence à tenir debout ! Et c'est totalement un-related à quoi que ce soit que l'on puisse imaginer, bien sûr ! Et ce serait déjà Fixed sur la production du A380 ! en plus! SYDNEY – An Airbus executive says Rolls-Royce has identified a faulty bearing box as the cause of oil leaks on some of the world's largest airliners. Airbus Chief Operating Officer John Leahy told reporters in Sydney that Rolls-Royce fixed the problem on newer models of the massive Trent 900 engine. He said Rolls was now fixing it on older versions. The Herald Sun newspaper reported his comments on its website. Airbus did not elaborate. 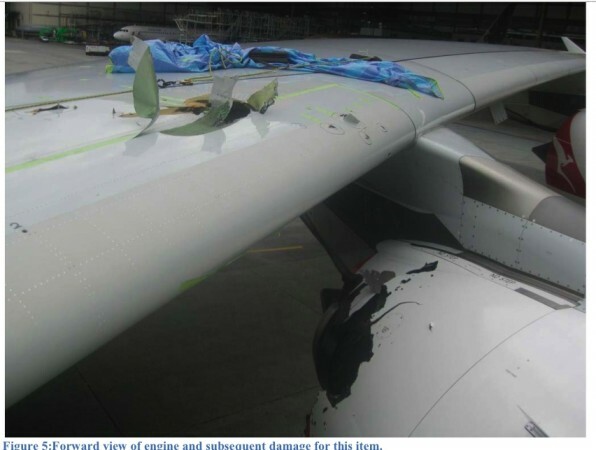 Rolls-Royce Group PLC said Friday that the midair disintegration of a Trent 900 on a Qantas A380 superjumbo last week resulted from a problem in a specific component, but it did not provide details. The box in question contains the metal ball bearings that allow movement of the drive shaft that powers jet engines. Et ... Le Seattle Times qui reprend ! Au fait, si les Actions de RR, remontent un peu, c'est grâce aux commentaires de John Leahy, car avec ce qu'ils ont sorti ce matin, RR ce n'était pas trop clair ! Rolls-Royce Group PLC said in an update to investors Friday that the disintegration of the engine resulted from a problem in a specific component in the Trent 900, but it did not provide details. Leahy said the new models of the Trent 900 had been redesigned to eliminate the problem of excess oil causing turbine fires. He said that Rolls-Royce was retrofitting the older versions with new parts to stop the oil leaks and computer software that would shut down an engine with leaking oil before it became at risk of disintegration. Leaks or oil stains have been discovered on six of the total of twenty A380s operated by Qantas, Lufthansa and Singapore Airlines that use the Trent 900 engines, a technologically advanced model designed to be lighter, quieter and more efficient than older engines. Qantas and Singapore Airlines have grounded nine of the world's largest airliner between them while Germany's Lufthansa has already replaced an engine on one of its A380s. Engines on the A380 malfunctioned four times before one of them disintegrated during a flight from Singapore to Sydney last week, and aviation experts have said that the earlier mishaps may hold clues to design or construction flaws. Airbus will take Rolls-Royce engines off the final assembly line in Toulouse, France, and send them to Qantas "so we can get Qantas back up and flying," the Airbus press office said. L'AD aurait du être émise au moment ou RR posait sur la solution non ? Airbus Chief Operating Officer John Leahy told reporters in Sydney that Rolls-Royce had at some point fixed the bearing box on newer versions of the massive Trent 900 engine, a model designed for the massive A380 superjumbo. He said Rolls was now fixing it on older versions. The Herald Sun reported his comments on its website. His comments did not address why Rolls-Royce had not fixed the bearing box in older versions of the engine. Four problems dating to 2008 led to two warnings for airlines to check parts of the Trent 900. Three of the four previous problems centered on the turbines or oil system. Joerg Handwerg, a spokesman for the pilots' union for German airline Lufthansa, said that minor problems are routine for any jet engine, but it is possible that the issues were an indication that regulators did not adequately check the engine before approving it for commercial use. Mais quid des avions en prodution ? Leahy soulève la question (cela dit si RR a une responsabilité, celle d'Airbus est normalement d'assurer un service après vente global.). Et pour moi, il le fait sacrément bien... Clark doit être content. RR qui commente d'abord pour les financiers et Airbus qui fait la com global. Oui Poncho, JL, et Airbus font le PR pour les 2 ! Et JL sur place pour aider les Qantas dans une mauvaise passe, c'est bien ! Je pense qu'implanter les modifs est peut être différent sur l'existant ... usinages à prévoir qui sait, et /ou retour usine, on verra ! Par contre le soft ... ben ils l'auraient installé à temps, un peu plus tôt disons ... ! Pourvu que la mère de toutes les root cause ait été isolée et traitée ! Et que ça explique aussi les cannelures qui se bouffent par exemple ! Allez bonne chance RR ! Et définitivement, s'ils ne disent rien et qu'ils avancent, tant mieux ! Et JL peut faire ce type de com's pour les 2 Ouarf, ce sera mieux fait ... et peut être qq procès en moins à la sortie de crise ! 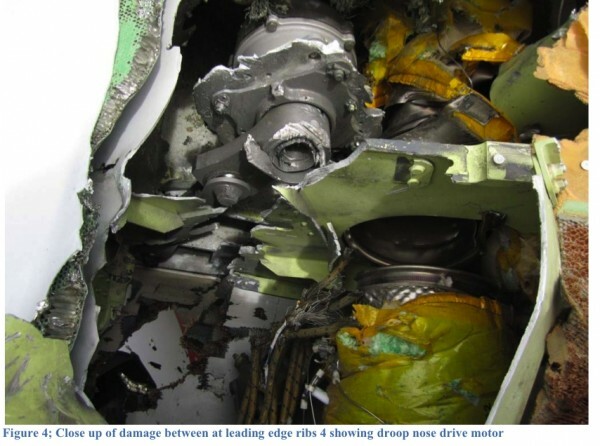 Questions are emerging about the design and vulnerability to serious malfunction of both the Rolls-Royce Trent 900 engine and the Airbus A380 airframe following the destructive failure of one of the turbofans on Qantas Flight QF32 Nov. 4. 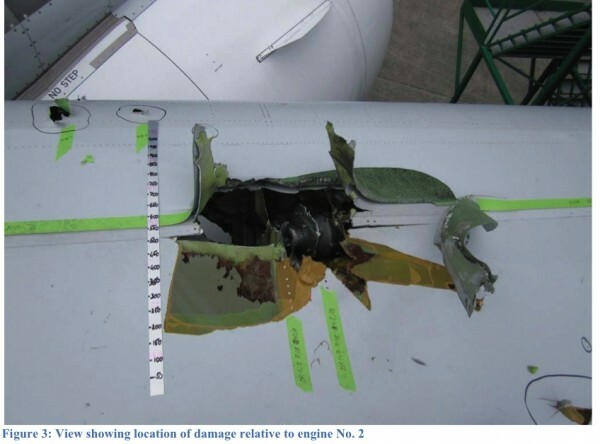 Flying debris from the engine’s uncontained failure caused extensive airframe damage, and appears to have punctured fuel tanks and knocked out some of the A380’s hydraulic and electrical systems, as well as rendered the No. 1 engine unresponsive to shutdown attempts. Moreover, it is not an isolated failure in Rolls-Royce’s Trent family. The Qantas incident comes shortly after a similar uncontained failure of a Boeing 787’s Trent 1000 during ground tests in August. While Rolls denies any direct link between them, in both cases the Trent’s intermediate pressure turbine (IPT) and oil system are suspect. The European Aviation Safety Agency identifies an oil fire as the likely cause of the engine failure in its Nov. 10 airworthiness directive (AD) requiring additional inspections of Trent 900s. In the wake of the Qantas incident, up to half of the world’s Trent-powered A380 fleet has been temporarily grounded. The engine failure occurred about 4 min. after Flight QF32 departed Singapore, bound for Sydney. The crew shut down the No. 2 engine, having received abnormal engine indications, and the aircraft returned to land about 45 min. later, after dumping fuel. As investigators try to establish the sequence of events that led to the Trent’s failure, they are also probing the A380 hydraulic and engine control systems’ apparent vulnerabilities to damage. And Rolls has to address concerns raised by senior industry executives over its safety philosophy, as neither the Trent 900 nor 1000 have automatic or mechanical systems to shut off fuel supply in an oil-fire-related ITP failure. Under scrutiny is why the engines continued to operate once the failures started, amplifying the destruction. Rolls designed the engine to run down intact after a turbine failure, yet it did not. From an airframe perspective, the failure of the A380’s standard and emergency engine shutdown systems, as well as the apparent loss of one of the two hydraulic systems, may also force system redesign. Another aircraft system question stems from the fact the No. 1 engine could not be shut down. The high-pressure fuel shutoff valve, normally controlled by the full authority digital engine control on the ground during engine start, is inhibited when the engine is running above idle or is in flight. “Fuel off” is normally selected to shut down the engine in this condition by activating a master lever to the “OFF” position in the flight deck. An emergency shutdown system, which also appears to have failed, consists of low-pressure fuel shutoff valves commanded by pushing the engine fire switch. The A380’s control surface actuators are powered by two independent hydraulic systems (Green and Yellow), with most surfaces having backup electrical power from one of two independent systems. 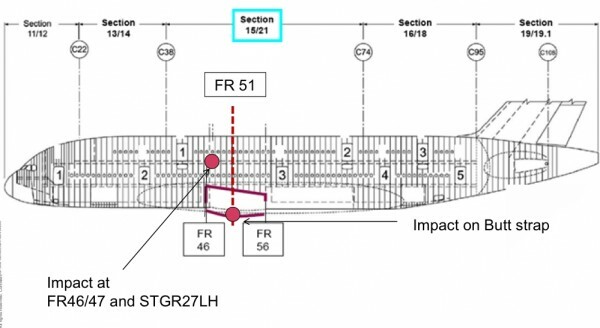 Images from the AF32 incident show evidence of certain inoperative control surfaces, pointing to a failure of the Green system. 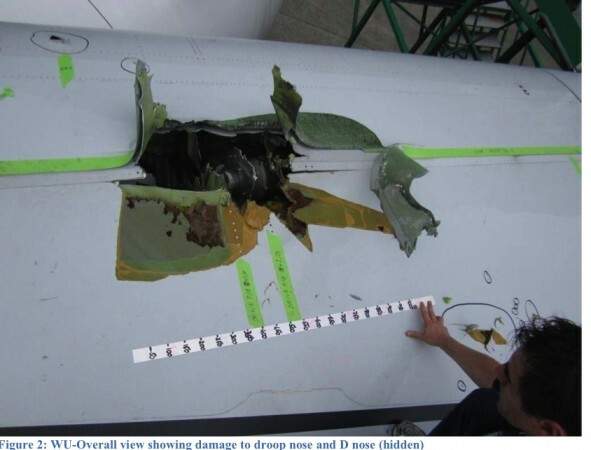 According to industry sources, debris from the uncontained failure punctured at least one fuel tank and may also have caused problems with the fuel system controls, which became partially inoperative and prevented some cross-feed functions. Merci Poncho, la liste pourrait être longue pour Airbus ... on en parlait ! Et l'EASA va les aider à faire le tri, s'ils trainent les pieds chez Airbus ! Encore des Mécréants qui ne croient pas au : U.N.R.E.L.A.T.E.D chez AviationWeek Ouarf ! Ben juste noter que le soft "Anti -survitesse", devrait être vite implanté, JL en parlait ce matin, et qu'il doit déjà l'être sur le T1000 depuis 1 mois, dommage d'avoir loupé le coche avec Qantas ! Ailleurs Qantas commente un arrêt pour qq jours plutôt que qq semaines ! Tiens, qq shémas, courtoisie de A.net ! Merci JamBrain ! Signs of a rapid disc burst are important clues to potential failure mechanisms. The Trent 900 IPT disc is thought to be a life-limited part (or life cycle fatigue-limited), which is designed with a high burst margin. In the event of a failure of the IP shaft, and a subsequent disc overspeed, the unit is designed to withstand substantial damage—including the loss of blades—without exceeding this margin. However, given the breakup of the disc, speculation is focusing on potential mechanisms that could reduce this margin, one of which is an oil fire. 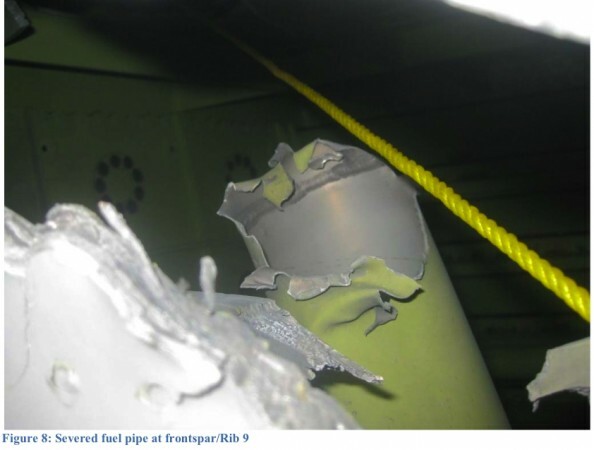 In such a situation, the fire would heat up the shaft, just as is believed to have occurred in the Trent 1000 test failure in August, weakening shaft strength and leading to almost simultaneous shearing of the shaft and disc failure. Although Rolls says the Trent 900 and Trent 1000 events were unconnected, and that “it is now clear this incident is specific to the Trent 900 engine,” the IPT and oil system are implicated in both cases. Rolls sources indicate the Trent 1000 test incident was linked to issues with the specific oil system in the test setup rather than in the production-standard engine. This may be why the company can claim the events are unconnected, even though the results are startlingly similar. Following these clues, EASA also identifies the oil system as the prime suspect in the A380 investigation and will likely, at the very least, make the oil system a watch item on the Trent 1000. Historically, Rolls has had to combat oil system issues with the A340-500/600’s Trent 500, on which the Trent 900 is heavily based. Longer-term actions, such as redesigning part of the oil system, are being considered. The Trent 900 oil system is made up of one main pressure pump, plus seven scavenge pumps feeding the accessory, step-aside and lower-level gearboxes, front bearing housing, internal gearbox, tail bearing housing and the suspect HP/IP bearing chamber. The system also includes a 15-micron scavenge filter as well as a 125-micron pressure filter, and various magnetic chip detectors. As part of the latest inspections, Rolls therefore told operators to check for any anomalies in the HP turbine gas path, as well as the platform at the front of the IP turbine for evidence of contact with the IP nozzle guide vanes. It also instructed a repeat of the intermediate coupling spline inspection AD if the time since the last inspection is greater than one-third of the 150-cycle inspection interval. 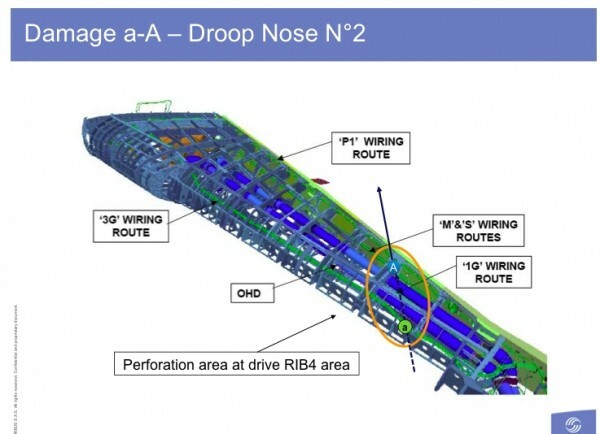 In addition to fixes that will almost certainly need to be identified, developed, tested and certificated for the Trent 900, the commonality between the IPT events on the A380 and 787 engines is expected to result in additional reviews of the hardware and software improvements already in train for the Trent 1000 following the August ground-test failure. Bon, accident "Containable" pour RR, ils ont de l'humour ! Noté, que en production, c'est fixed at "Some Point"
Et que 3 Qantas seront livrés "At some point" pour la fin de l'année ! Tout serait résolu définitivement ... ou at Some point ??? Sais pas, à suivre ! "This program will enable our customers progressively to bring the whole fleet back into service," he said. He offered no details and Rolls-Royce declined to comment on remarks to reporters in Sydney by Airbus' Leahy, who said that Rolls-Royce had at some point fixed the bearing box on newer versions of the Trent 900. He said Rolls was now fixing it on older versions. The Herald Sun newspaper reported his comments on its website. Leahy's comments did not address why Rolls-Royce had not fixed the bearing box in older versions of the engine. Airbus did not elaborate. The box in question contains the metal ball bearings that allow movement of the drive shaft that spins the turbines inside jet engines. Keeping customers like Airbus and the airlines on its side is critical for Rolls-Royce, the world no. 2 behind Fairfield, Connecticut-based General Electric. The last thing they need is for companies to defect to the alternative engines for the A380 made by the Engine Alliance, a 50/50 joint venture between GE Aircraft Engines and Pratt & Whitney, which are currently used by Emirates and Air France. Rolls-Royce makes almost half its 10 billion pound ($16 billion) annual revenues from its civil aerospace division. The Trent series and its RB211 engines, which power Boeing Co.'s under-development 747 jetliner, account for nearly two-thirds of that. Rolls-Royce does not break down sales for each type of engine, but sales of the Trent 900 are significant. The company has orders to equip 70 new A380s and airlines have option for 20 more. Qantas CEO Alan Joyce and his counterpart at Lufthansa, Wolfgang Mayrhuber, have so far been supportive of the continued use of the Trent 900 engines in their A380s and Leahy said that three A380s due to be delivered to Qantas by the end of the year would be fitted with Trent 900 engines that have a design upgrade. Rolls-Royce, which also has marine and defense divisions, acknowledged Friday that its full-year earnings would be "slightly lower than previously guided" because of the crisis. Back in July, it said that its underlying profits would grow by 4-5 percent compared to 2009. Jonathan Jackson, head of equities at Killik & Co. said that while uncertainty surrounding the Trent 900 engine is "likely to linger for a while longer, today's statement provides reassurance that the incident is containable, and that the scale of the share price reaction this week looks overdone." "However, we would highlight that a purchase of the shares is not without risk in the short term," Jackson added. Engines on the A380 malfunctioned four times before one of them disintegrated during the flight from Singapore to Sydney last week, and aviation experts have said that the earlier mishaps may hold clues to design or construction flaws. Les dégâts et les pertes de fonctionnalités du A380 vues par les pilotes ... et ils étaient nombreux à bord, des check's en cours ! Des confirmations, qui devraient conduire Airbus à certaines réflexions, avant que l'EASA ne s'en occupe ! The exploded engine was scary enough. But in the days following the emergency landing of the Qantas A380 in Singapore, it has become clear just how dangerous the situation was. Multiple systems on the aircraft failed and a disaster was only narrowly avoided. Rarely had so much flying expertise been assembled in one cockpit. A training pilot was sitting behind Captain Richard de Crespigny, who was completing his annual flight test. Sitting next to them was a third captain whose job was to supervise the training pilot. Together, the Airbus A380 operated by Australia's Qantas Airways had a total of 100 years of flying experience sitting in its cockpit. Four minutes after takeoff from Singapore, that accumulated expertise was suddenly in great demand. At an altitude of 2,000 meters (6,560 feet), engine two of the double-decker aircraft exploded. The loud bang of the detonation had hardly faded away before 53 error messages appeared on the monitors. "It was unbelievably stressful. But in a situation like that, you have no choice but to keep on going," says Richard Woodward. The captain knows what he is talking about. He also flies the A380 for Qantas, is the vice president of the International Federation of Airline Pilots' Associations (IFALPA) and has looked after the crew since the near-catastrophe almost two weeks ago. "The crew has dealt with this situation extraordinarily well," Woodward reports. "They're like horseback riders who, after a fall, are eager to get back on their horses." "This raises the question of whether the aircraft is improperly designed," says Woodward. "Apparently certain connections are not redundant; or the two cables are positioned so close together that the shrapnel destroyed them simultaneously." The aircraft manufacturer is defending itself against such accusations. The aircraft, says Airbus spokesman Stefan Schaffrath, was "controllable until the landing," and the autopilot continued to function. "There are two separate hydraulic and electrical systems," Schaffrath adds. But some of the brakes were no longer working properly. Luckily, the pilots were able to land in Singapore, which has a very long, 4,000-meter runway. Another dramatic aspect of the emergency landing was that an anti-lock system also stopped working. Three tires burst when the plane touched down as a result, sending sparks into the air. "And that was with two holes in the tank!" says Woodward. At least the reason for the engine explosion is now clear. Last week, Rolls-Royce identified a defective part in the turbine, which caused an oil leak that led to the fire. Of the superjumbo jets delivered to date, 20 are affected by the problem, including three at Lufthansa. The defective engine part will gradually be replaced. Qantas pilot Woodward is pleased that his company has made a "very conservative safety decision" to temporarily ground the A380. But he does wonder why the other airlines potentially affected by the engine defect are not taking similar precautions. Lufthansa points out that it has such short maintenance intervals that dangerous oil leaks are bound to be discovered. But Woodward isn't convinced, saying: "Our plane had just returned from maintenance in Frankfurt, and the accident happened nonetheless." A nuancer quand même... le rapport de l'ATSB devrait sortir pour mi décembre. Il est possible que le secours restituent qu'une partie des fonctionnalités d'origine seulement, juste de quoi assurer un retour à bon port, sans luxe, mais un retour quand même. On verra, mais je sens que l'EASA va bouger ! Des circuits redondants trop proches et des sécurités à revoir (Extincteurs vu, OK, coupures de fuel... et transferts de réservoirs ! Ca va re-toquer un peu à mon avis , et chez RR aussi, c'est bien possible ! Tu as raison Poncho, il faudra attendre le rapport préliminaire ..! Terrible coup de canon ! Il y en a qui veulent savoir et montrent du doigt les dégâts ! Ben Sandiland "Plane Talking" en tête et Qantas qui ne doit pas être loin derrière pour faciliter les accés! La grande question, y a t' il une réelle convergence d'intérêts entre une Airline, et un fournisseur (Fabricant) de moteurs facturés (Loués) à l'heure de vol réelle ! Bon ça marche chez Anet, et pas ici ! Grrr ! essayer ça! Et ceux qui préfèrent ne rien dire ! Bon, on peut supposer qu'ils sont aussi 24/7 sur le sujet ! ZHUHAI -- Rolls-Royce, beset by criticism over its public handling of the uncontained failures of its Trent 900 and 1000 engines, has canceled its planned Airshow China show briefing. 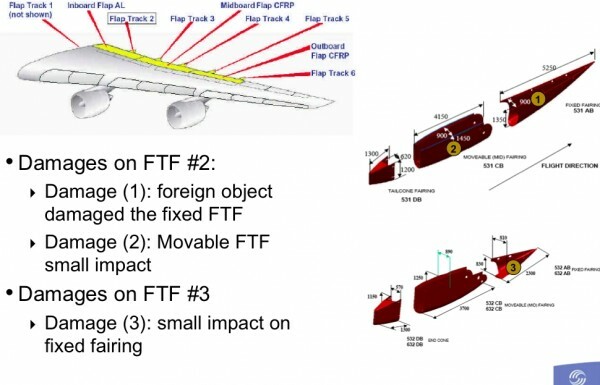 The Airbus presentation to accident investigators of the damage done to QF32 on November 4 gives new technical insights into this near disaster involving a Qantas A380 with 466 persons on board. The examination of the damage is far from complete, as the presentation makes clear. It doesn’t deal with the other dimensions of this serious incident, which are the loss or impairment of various systems on the giant airliner, and the emerging difficulties the crew faced from fuel load imbalance caused by some of those failures. 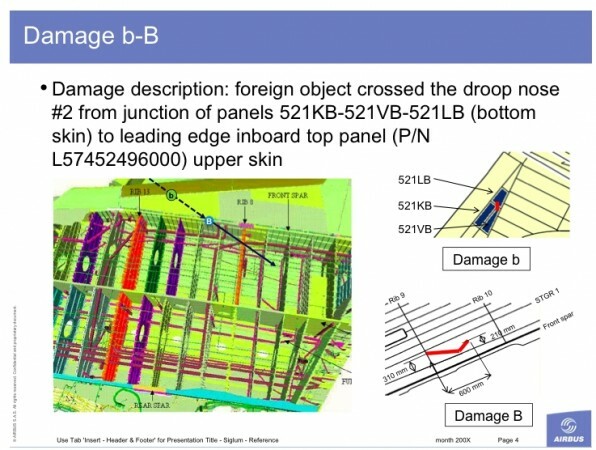 The set of graphics shown above were accompanied by a brief written and photographic overview of the damage as currently assessed. Merci beaucoup pour le lien vers cet article, très intéressant, je n'avais pas remarqué que le fuselage aussi avait été touché. Ils ont quand même eu chaud... ou bien est-ce l'aile qui a absorbé l'énergie initiale d'une pièce l'ayant traversée puis ayant continué vers le fuselage ? Il y a le disk en 3 ou plus de morceaux ! Tous des coups de bazooka potentiellement mortels, on peut penser qu'une partie à pu s'échapper sans faire de dégâts ... mais les gros trous, ce sont des morceaux de disc , à mon avis ! Et les petits trous, ce sont les schrapnels, les aubes, ça va aussi vite ou plus, mais c'est plus léger, ça peut avoir traversé des "Peaux" et touché le fuselage! On peut aussi penser que certains morceaux ont été déviés et / ou ont ricoché ! Sur le 767 AA (CF6) qui a sauté à LAX, ils ont récupéré un morceau de disk de 15 Kg (Ou livres, sais plus) à 750 mètres ... juste pour avoir une idée, et le CF6 est un moteur plus petit ! Je reviens sur l'article de Ben Sandiland ! Juste lire le débat qui suit ! 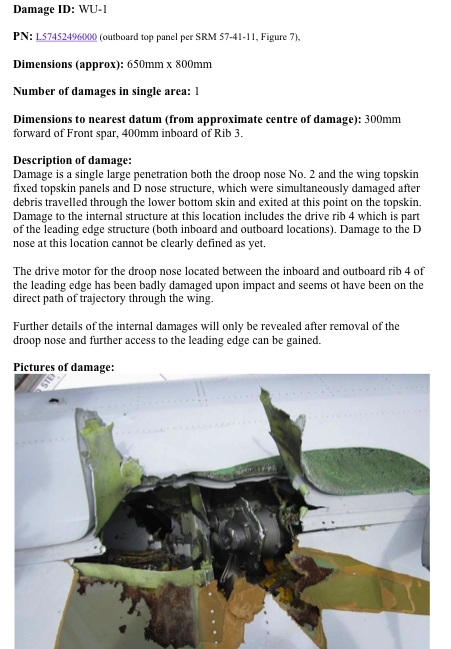 Bon ça commence à sortir par les canaux "officiels"
Assessment of the Qantas Airbus A380 involved in an in-flight engine failure has revealed the extent of peripheral damage to the jet from ejected fragments. 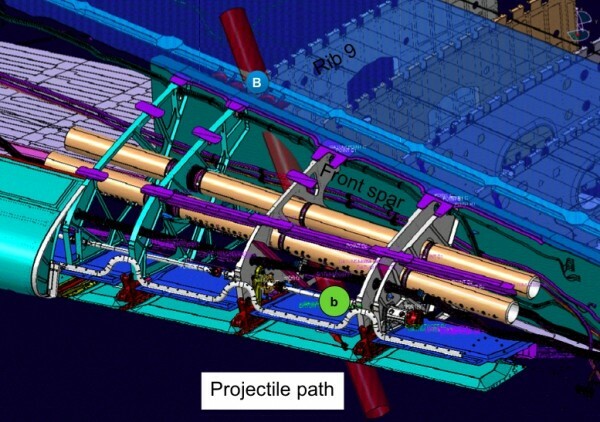 While the Australian investigation team leading the inquiry has yet to produce a preliminary report, ATI has ascertained that three high-energy fragments were released by the intermediate-pressure turbine disk during the failure of the inboard left-hand Rolls-Royce Trent 900 engine on flight QF32. Two of the three sections of disk debris cut through two wiring routes and this damage subsequently prevented the shutdown of the adjacent outboard engine after the aircraft landed at Singapore. 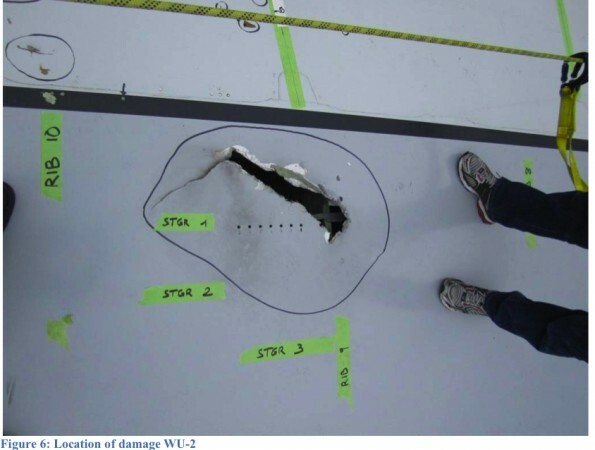 Sources familiar with the investigation state that the crew "had to manage a dynamic situation" as the A380 sustained structural and systems damage in several other areas. While all flight-control surfaces remained available in the pitch and yaw axes, roll control was affected although it continued to be available through the inner aileron on the left wing, and the mid- and inner aileron on the right wing. Several spoilers - four on the left wing, and five on the right - were also able to contribute to roll control. These spoilers were those activated by the 'yellow' hydraulic channel, one of two hydraulic systems on the type. Slats on the aircraft - which are linked to the 'green' hydraulic channel - were jammed in the retracted position but the flaps, which are connected to both channels, were available to the pilots. Loss of the slats and partial degradation of the roll control led the A380's flight-control laws to revert to 'alternate', while 'normal' law was retained in the longitudinal and lateral axes. "Flight envelope protections were still active," the source states. As the aircraft returned to Singapore following the engine failure, the autopilot remained engaged until the jet descended to about 700ft at which point the crew took manual control of the aircraft, with the flight directors on. This also included manual control of the three remaining operational engines on the stricken aircraft. Flaps were in position '3', one stage from full deployment, the normal configuration for approach. The landing took place about 1h 40min after the failure. Normal braking was available on the fuselage landing-gear bogies, including anti-skid, while alternate braking without anti-skid was available on the wing landing-gear. "The crew modulated braking in order to stop close to emergency services," says the source. Airbus and Rolls-Royce simply state that they are assisting the Australian Transport Safety Bureau with the investigation and are supporting other operators of Trent 900-powered A380s. Australian safety authorities expect by the end of this week to finish their inspection of the Qantas Airbus A380 engine that suffered an uncontained failure near Singapore on Nov. 4. The Rolls-Royce Trent 900 engine “is being progressively dismantled” in an engine workshop in Singapore, according to the Australian Transport Safety Bureau (ATSB). The agency says it will issue a preliminary factual report by Dec. 3. The areas of most concern have been investigated, with the removal of the low-pressure turbine module enabling access to the damaged intermediate-pressure turbine area. The disassembly and examination of the rest of the engine should be completed within days. Meanwhile, the ATSB says analysis has been completed on the recovered section of the No. 2 engine turbine disk that was identified as being crucial to the investigation. This was carried out at a Rolls-Royce facility in the U.K., under the supervision of the ATSB. The search for the rest of the turbine disk and other engine debris has been concluded by the Indonesian National Transportation Safety Committee and the ATSB. Several smaller components were discovered, including turbine blades and blade attachments, but remaining “significant parts” of the turbine disk were not found, the ATSB says. An Airbus information telex (AIT) to all A380 operators was dispatched by the manufacturer on 17 November informing them, basically, of what the crew of flight QF32 had to deal with when their No 2 Rolls-Royce Trent 900 engine suffered an uncontained engine failure. "This AIT has been approved for release by the Australian Transport Safety Bureau (ATSB) who leads the on-going ICAO Annex 13 investigation. "The second R-R inspection program applicable to the Trent 900 engine family and covered by EASA Engine Airworthiness Directive has been published allowing continuous operations of the fleet. Together with its partners, Airbus is providing support to the operators for engine logistics to minimize interruptions to the fleet. "One single high energy fragment [see graphic] is considered from a certification requirement viewpoint. 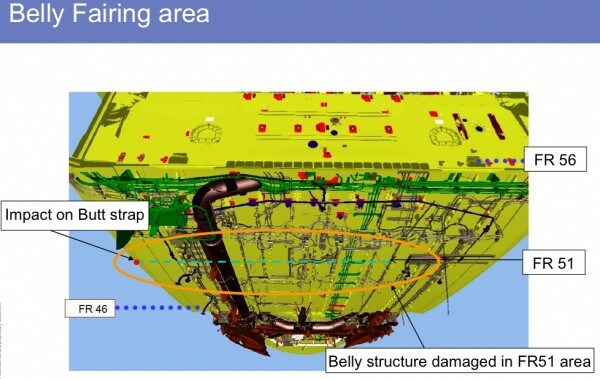 The damage assessment has established that the intermediate pressure turbine (IPT) disc released three different high energy fragments, resulting in some structural and systems damage, with associated ECAM warnings. Therefore the crew had to manage a dynamic situation. •Roll control was ensured through the following controls: (a) on the left wing: inner aileron, spoilers 1, 3, 5 and 7; (b) on the right wing: mid and inner ailerons, spoilers 1, 3, 5, 6 and 7. •"Flight control law reverted to Alternate Law due to the loss of the slats and of some roll control surfaces. Normal Law was kept on longitudinal and lateral axes. 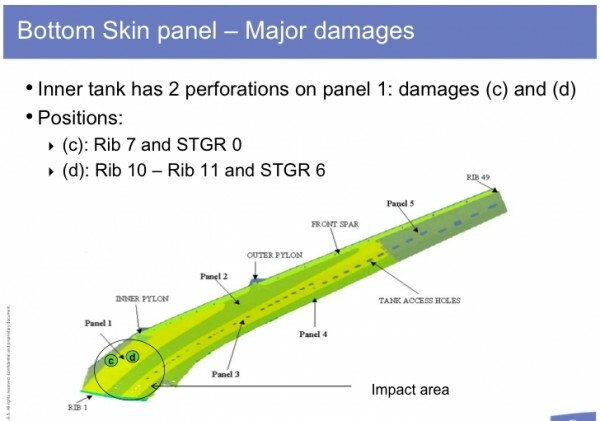 •"Flight envelope protection was still active. •"The autopilot was kept engaged [during approach] until about 700ft on radio altimeter, at which time the crew took over manually. Flight Directors were ON. •"Manual control of engines 1, 3 & 4 was maintained till aircraft stop. •"Landing in Singapore took place about 1 hour 40 minutes after the engine 2 failure with flaps in configuration 3. •"Normal braking was available on both body landing gears with antiskid, and alternate braking without antiskid on both wing landing gears. The crew modulated braking in order to stop close to emergency services. •"The reason engine No 1 could not be shut down after the aircraft came to a stop, has been determined: Two segregated wiring routes were cut by 2 out of the 3 individual units of disc debris." Le traitement spécial subit par l'A380 c'est DEUX débris à haute énergie (et deux sacrés trous...) sous entendu : les pertes de redondances ou de fonctionnalités (éventuelles) dans ce cas extrême et au delà de la certif sont "compréhensibles"
De mon point de vue, cet article donne finalement l'impression que les systèmes redondants n'ont pas si mal fonctionné. En particulier, cela révèle que les rumeurs de problèmes sérieux sur les freins qui courraient sur a.net étaient fausses ("the crew modulated braking"). La reprise de contrôle à 700ft est peut être une procédure normale (je ne suis pas pilote, mais j'ai souvent vu un tel passage mentionné dans des récits d'atterrissages "normaux"). Bien sûr, il sera intéressant de voir les conclusions du rapport (je ne sais plus où j'ai lu cela, mais on devrait avoir des nouvelles du ATSB début décembre). Ouais, le retour a été assuré ! Au vu de tous ces rapports d'évaluation partielle des dommages, on peut conclure que le gros débris (sans doute 1/3 du disque en cause) a causé un maximum de dégâts et peut être comparé à un obus antiaérien de gros calibre, du genre de ceux qui coupaient en deux un B1-17 ou un Liberator. Les dommages au longeron sont impressionnants et avec le moteur hydraulique éclaté, il est normal que les becs soient restés rentrés (heureusement). Concernant les autres éclats, y a-t-il eu des signes de dépressurisation ? Il ne devait pas être trop haut en tout cas. A part le fait que les deux faisceaux électriques ont été coupé en même temps, on ne peut pas reprocher grand chose à la redondance prévue par Airbus. La question du réservoir est préoccupante, mais il n'y a pas grand chose à faire, c'est un avion, pas un tank. Et quand on aura un 787 touché par un tel projectile on en reparlera. J'ai hâte de lire le rapport préliminaire de l'AAIB. Bien vu Poncho, on s'est croisé ! Petit point de Qantas qui va remettre prudemment 2A380 "En route" sous les dernières normes d'inspection recommandées ! Thrust settings limités, et pas de vols vers les USA, trop "P" demandeurs ! Et aussi : 16 moteurs démontés, pour les échanges (Ou lesréparations ?? ), donc 4 avions attendent des T900 qui soient MAJ par RR et suffisamment sécurisés ! Avec 2 avions neufs à venir avant Noël, Qantas pense pouvoir passer les fêtes, avec 4 avions en service ! Pas d'indications de délais pour le rythme des MAJ des moteurs ! Bien, Qantas remet en route doucement, après les émotions passées, pas vraiment rassurés pour autant !